Picture below show 3 plate mold after assembly, the position indicate ready to handling by crane, eye bolt was attached at center of mold plate. 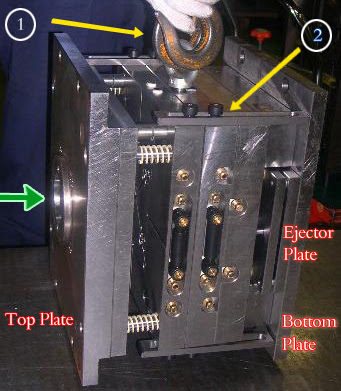 after assembly process, make sure you has attached the tension link in 3 plate mold type or safety bolt or magnet in 2 plate type of mold this to prevent mold plate falling down when handling up with crane, when design eye bolt for handling, give bolt hole about 1 cm more to cavity direction from center line of mass of mold, it's commonly in plate 3 or 4 depending on how wide each mold plate, why it's must move about 1 cm ? the reason is same as safety bold, by move those bolt position when handling with crane mold base will decline about 5-30 degree, and top plate in upper position, this method make more secure when handling. at this picture below, number 1 is eye bolt position in ready position to handling, and tension link (2) was attached. 1. Attached tension link, tension link function is o pull plate number 3 or cavity plate then by puller bolt, cavity plate will also pull the second plate, and cut the runner from nozzle. 2. second plate, it's indicate that those mold is 3 plate mold type, why because in 2 plate type, second plate is doesn't use. second plate is necessary when gate type is pin point gate. 3. runner plate, if you see more carefully, between second plate and third plate attached runner plate, in 2 plate mold type, runner plate does not use, because runner attached in third plate. green arrow show injection nozzle machine where must be attached and indicate flow of plastic material during injection process.